Finding stories from datasets need not be something exclusive to large global news organisations populated with specialist journalists and developers devoted to producing data driven articles. Regional and local news websites and blogs in the UK have a great deal of data available to them – with hopefully more on the way – and the potential to interrogate that data to produce interesting stories and visualisations is certainly there. Earlier this month, as web editor of the Hackney Post, a local news website run periodically by journalism students at City University as part of our production weeks, my strategy was to have one data driven story a day accompanied by interactives such as maps, graphs or charts wherever possible. To plan for these stories, we looked back at what data had been recently released specific to Hackney or London boroughs. Possibly the best website for London-specific datasets is the London Datastore, built by the Greater London Authority (GLA) in a bid towards making more of the capital’s data freely available. The GLA actually claims to be committed to “influencing and cajoling other public sector organisations into releasing their data” on the site, which is a very noble and praiseworthy, and there are some really interesting datasets to explore. I found some recently published statistics on teenage pregnancies across London and some updated data on food hygiene, while the Bureau of Investigative Journalism had released the regional breakdown of the data behind their story about the prevalence of payday lender shops across the UK. We looked at each dataset, trying to identify potential stories and we did not come out empty-handed. 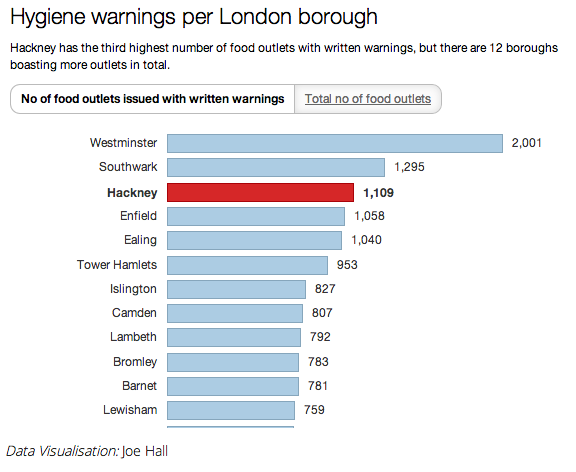 By analysing the food hygiene data for London, Joe Hall found that half of all Hackney’s food outlets were hit with hygiene warnings in 2013, a figure which constituted the highest rate in London. This is the story we published. When it came to teenage pregnancy across London over a 15-year period, Sophie Murray Morris found that while the rate of under-18 pregnancies has fallen by 38 per cent in the capital from 1998, the third biggest decrease of any London borough was in Hackney, with a decrease of almost 50%. This was the resulting story. In both cases, the data was freely available in a clean, structured format and only needed some basic analysis in Excel to compare by region, providing some added context to the figures. The maps, created with Google Fusion tables, also include charts in the infowindow to show how each borough compares to the rest of London and England. (Here is a tutorial I wrote showing how to do that). Evidence of the value that data driven stories have in engaging readers lies in the analytics. In the month from February 24 to March 26, readers on average spent two minutes and thirty seconds on a page of The Hackney Post. When it came to the stories involving interactive data content, all five stories published in the week I was editor were well above average in terms of this dwell time, with four of five posts enjoying almost double that at around 5 minutes. These are by no means ground-breaking investigative data driven stories and could perhaps have been built up further with more analysis had we had more time to explore other potentially interesting patterns in the data. However, it just shows that with some simple spreadsheet experience and basic data visualisation skills, regional news outlets can produce interesting stories going beyond citing just the headline figures for their area that generally lack context, as in this example, which is one of many similar local stories online. The Trinity Mirror’s ‘data unit’ established last year, where data journalists supply their regional titles with engaging data driven stories on a daily basis, looks like a step in the right direction and hopefully an example of things to come. Here’s an example of one of the most successful stories they’ve done, a schools database, as featured in the Birmingham Mail. The fact that they are also expanding the team shows that there is a real future in the work they do. Hopefully, this is just the start when it comes to producing interesting data-driven content to engage regional audiences and not a one-off. As the ability to analyse and build stories using a large volume of data becomes an increasingly important skill for journalists to have, regional outlets need not get left behind. Nassos Stylianou's insights and experiences in digital journalism. Very much a work in progress.